The Hotel Paisano is the perfect spot to host small or large business meetings, board and/or staff retreats. Arrangements for group lodging and on-site meals can be made through the hotel and restaurant management. 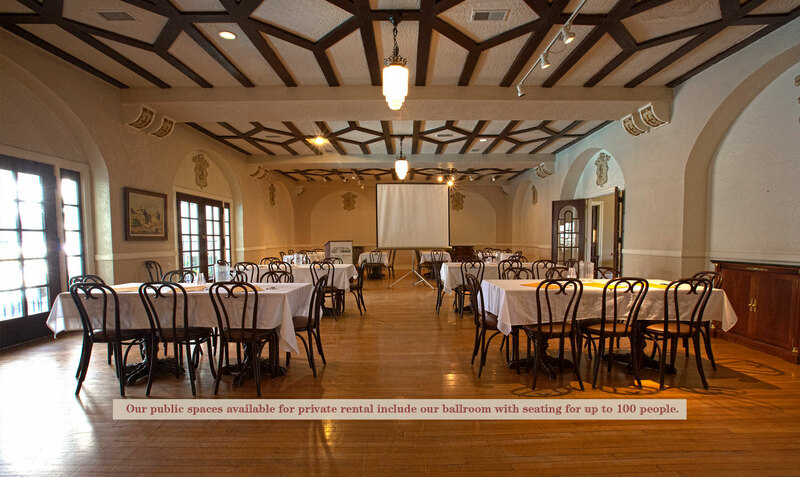 The Hotel Ballroom with original wooden floors, exposed ceiling beams and vintage pendant lighting can comfortable seat up to 85 guests for meetings and conferences. Two sets of original French doors offer a view of the swimming pool complete with glowing lights and a flowing waterfall. A third set of French doors allows easy access to the on-site restaurant and bar. Perfect for meetings, seated dinners and buffets, the ballroom will also serve as a dance floor with the accompaniment of live or recorded music. The Central Courtyard is a convenient setting for receptions, cocktail parties, dinner and entertainment. The patio is furnished with round iron tables and chairs and other casual sitting areas around a tiered water fountain. Iron archways lead from the Texas Street sidewalk into the courtyard and from there guests may enter the hotel lobby, restaurant, and gift shop or fitness center. The archway gates may be closed during private parties. Standing balconies and patios overlook the courtyard from rooms and suites on the second floor. Additional seating may be placed in the courtyard for larger dinner parties. Temporary bars may be set up to serve outdoor parties. Musical performers may play outside or inside for dancing and entertainment. The Sun Porch, located at the west end of the mezzanine level and overlooking the hotel’s swimming pool, is perfect for small group meals, meetings or parties. The room is equipped with a working bar that may be stocked through our restaurant for private events. The room can be furnished with sofas for lounging or tables and chairs for meetings or meals. The Fireplace Lounge, a welcoming sitting area situated between the lobby and ballroom and adjacent to Jett’s Grill, is a natural place setting for pre-dinner or pre-meeting reception and/or cocktails. “… the Hotel Paisano staff helped make our event a resounding success!